Home › Health › How Much Does A Root Canal Cost? 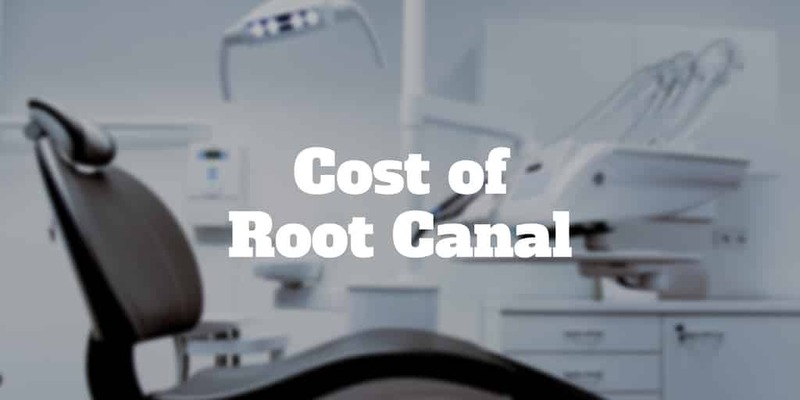 If your tooth aches and your dentist has told you that you need treatment, the first thought to cross your mind may be how much does a root canal cost? Before you add heartburn to your tooth ailment when you discover the price of a root canal procedure, it may be worth taking a deep breath and thinking about the consequences of not pursuing treatment. If you procrastinate on necessary root canal treatment, you may need a tooth extraction down the line. Fillings and antibiotics may not be enough to get rid of the infection. And if you let the infection linger and ultimately need your tooth pulled, your other teeth may drift, which can cause bite changes and even alterations to your facial appearance. So, if you are going to forego dental work, a root canal is probably not the dental procedure to skip. So if you must sit in the dentist’s chair, how much will a root canal cost? The cost of root canal treatment is not fixed but instead varies by where you live, the dentist you choose, and the tooth needing treatment. The reason cost varies by tooth is that front teeth have just one root while molars can have up to three roots. And after the root canal procedure has been completed, your endodontist will generally need to place a crown on the tooth. If you are lucky, you may escape with just a filling but a crown is more likely unless you visited your dentist as soon as you felt some tooth sensitivity. The cost of the crown is added to the root canal cost so the total can add up to a hefty sum. Provided no complications, such as a cracked tooth occur, you won’t be hit with additional charges. And you may even be able to use insurance to help offset the root canal cost and the crown placement. We gathered data provided by FairHealthConsumer.org on the costs of root canal treatment in different geographies. With a known price estimate, you can negotiate with a non-network dentist if you do have insurance or an in-network dentist if you don’t have insurance. If your dentist quotes you a much higher price, you can use the data from Fair Health Consumer for your zip code to request a lower price. From our research, root canal costs in the middle of the country, such as Iowa, were 30% cheaper than those in California’s Bay Area and 50% cheaper than the prices in Manhattan. Generally, a restorative crown is needed in addition to the root canal procedure. In Manhattan, the average cost of a porcelain or ceramic substrate crown is $2,250 without insurance. On the West Coast in San Francisco, the average price is quite a bit lower: $1,600. When you sum up the totals, Big Apple residents may pay as much as $4,250 for a root canal procedure plus a restorative porcelain or ceramic crown while West Coasters will fork over as much as $3,195 and patients in the middle of the country get the best deal by shelling out approximately $2,150. No matter where you live, the prices are steep. So how can you save on root canal costs? When you visit your dentist for a crown or root canal procedure, your dental insurance plan may cover up to 90% of the cost after you pay a deductible. Imagine for a moment that you need a root canal with a restorative crown procedure that your dentist charged $3,000 to treat, how much would you pay out of pocket? If your deductible was $250, and your dental insurance plan covered 90% of the cost after the deductible, then you would pay 10% of $2,750 which amounts to $275. Some dental insurance plans may only cover half the price after the deductible, meaning that you would pay $250 plus 50% of $2,750 for a total of $1,625. The wide spread between having a dental insurance plan that covers almost the entire cost of the root canal procedure and only half of it is so large that it would be well worth your time shopping around for dental insurance plans to get the best deal. Root canal treatments are expensive, especially if you don’t have dental insurance but you do have options to lower your dental bill. Your best bet to save money on your root canal treatment is to negotiate with your dentist. If you are honest with your dentist about how paying for the procedure is a financial struggle, you may be able to earn a price discount. You could even go so far as to ask your dentist for a discount for providing patient referrals. Dental insurers are smart enough to know that some patients will buy insurance today for a dental procedure tomorrow. To mitigate this risk, insurers frequently won’t provide dental coverage for a period of time that can be many months in the future. If you have a root canal that needs urgent treatment, you don’t want to be waiting for your coverage to take effect but if time is on your side it may be well worth the annual cost of a few hundred dollars per year to have your insurer foot the bill for a few thousand dollars down the line. When you shop around, you may find the dental insurers charge hefty premiums so you could explore a HMO that may be cheaper but will also usually have fewer dentists. Believe it or not, you could save on root canal costs by visiting a school of dentistry where student dentists will perform the procedure. While the thought of an inexperienced student dentist having free reign over your achy tooth may seem terrifying, the reality may be much more mundane because professors generally oversee procedures. You will likely be stuck in your chair longer than if you were with an experienced dentist however, but it may be worth the extra time to save on cost. Jumping on a plane to another country may not be an ideal way to lower your dental bill but when you crunch the numbers you might be surprised to find it could be more economical. Salaries paid to dentists in other countries, such as Mexico, can be as much as 70% lower than those paid to U.S. dentists and that can translate to significantly lower dental treatments. The big caveat when traveling abroad to find a dentist is that you will need to do some extra due diligence to verify the quality of care is up to par. Some dentists abroad may even be willing to accept U.S. health insurance plans. If you have been depositing cash in a piggy bank at home for a rainy day, an upcoming root canal treatment may be the time to break it open. But before you take a hammer to Ms. Piggy, ask your dentist first if you can receive a discount for paying by cash upfront. It may be a win-win whereby your dentist receives immediate payment while you get a deal. Groupon and Living Social are constantly scouting local businesses for opportunities to promote daily deals to their website visitors. Often, you will find dentists feature special deals for procedures that would otherwise be costly. The dentists hope that by giving you a bargain basement deal, you will become a loyal customer so both of you win when you sign up for the deal. When you pay your dental bill with your credit card, you may be able to earn points that offset the cost of the bill a little bit, even if only by a few percent. Although you should try to avoid taking on credit card debt if you can at all avoid it, you might not be left with much choice if you need an urgent root canal treatment. And if you do rack up some credit card debt, you could look to transfer the balance to a card like Discover It later to save on interest rate charges. It is common when buying furniture or expensive appliances to be offered a payment plan. Companies like Affirm specialize in helping customers to pay over time when checking out at a retail store so why not ask your dentist for a similar deal? You could suggest that you pay for your root canal procedure in installments. If you do plan to ask for a payment plan, make sure to mention it before the treatment so your dentist is agreeable to the idea. No matter where you live in the United States, root canals are costly but you will be stung with especially high charges if you live in cities like New York and San Francisco. When you get a root canal, you should expect to pay not just for the procedure but also for the cost of a restorative crown. To lower your dental bill, it is ideal to have dental insurance coverage that pays for a good chunk of the bill but if you don’t have insurance, consider alternative payment solutions. For example, you could travel abroad, ask for a payment plan, pay cash upfront, negotiate a lower bill or even visit a school of dentistry. No matter what payment option you choose, it would be wise not to let any infected tooth linger untreated because the risk of a more serious and costly procedure later may be high. Have you had a root canal treatment? What tips can you share to save on costs? We would love to hear your experiences. Share your thoughts in the comments section below. >> Is Health IQ Best For Life Insurance? >> What Is The Best Organic Tampons Brand?